Whoever said that eating gluten free on a budget wasn’t possible??? I’m out to prove that myth wrong with this new meal plan that will make 21 meals (for 4 people!) for a total of $162, using ingredients purchased at Costco. 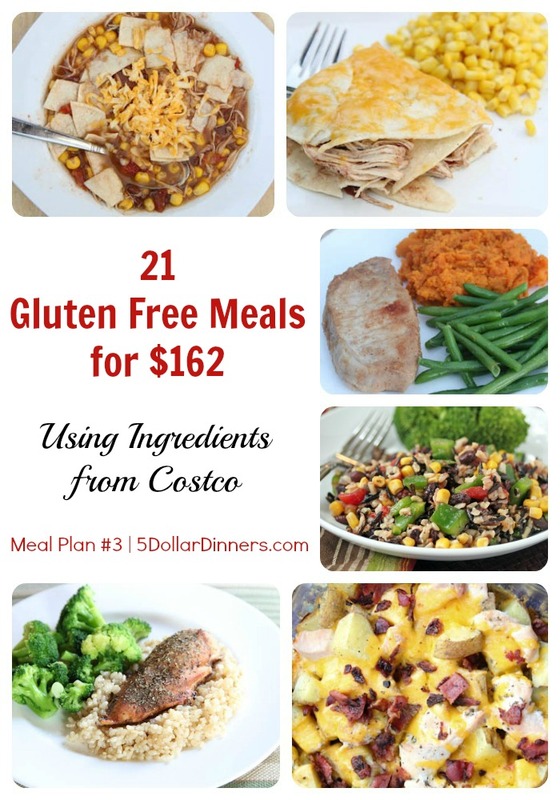 When you base your meals around gluten-free (and inexpensive) starches like brown rice, potatoes and sweet potatoes, it really doesn’t cost much more to eat gluten-free! Yes, I realize this makes for $7.85 dinners…but they are gluten free…pennies more expensive, but still really cheap! Meat at Costco is more expensive than sale prices at grocery stores, and many argue that the quality is better. As always, you are responsible for reading labels and ensuring that everything is Gluten Free. See all of the FAQs for the Warehouse Store Meal Plans here. In order to keep this plan simple and make the most of the different ingredient sizes (hello, 15 lbs. of potatoes & 100 tortillas!!! ), I decided to do 10 meals times two plus one, for a total of 21 meals. These products are not featured in this plan, just thought it would be helpful for those who don’t have memberships, or who haven’t seen these yet in Costco stores. Namaste gluten free baking mix, 5 lb. bag – price unknown, my store is out of stock at the moment! While we have all the content free above that you could piece together, we thought we’d simplify the process for you. This printable has the complete grocery shopping list (with south TX Costco prices), as well as complete recipes with ingredients broken down to make it easy for you. It also includes all the pantry staples and any additional grocery store items you might need to grab, if you don’t already have them. All in one place y’all! 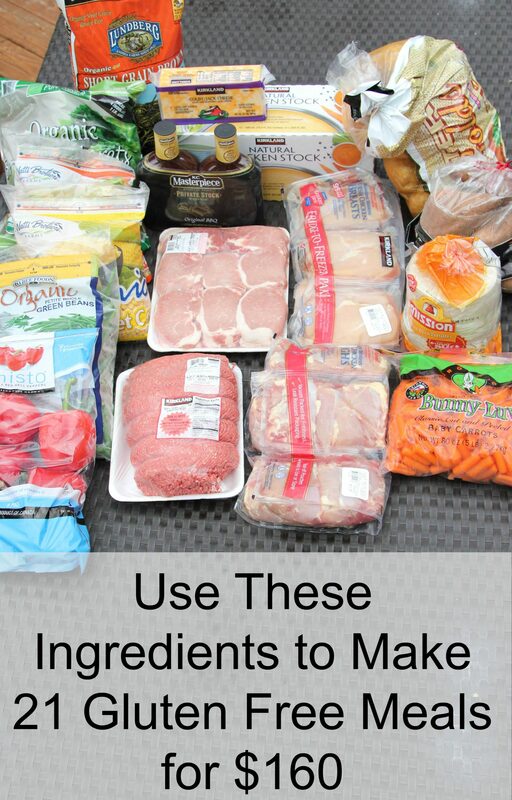 This is worth gold when it comes to saving time in preparing to shop and cook your meals. And don’t forget to visit the e-store to see if there are any other plans you wish to get before you checkout! Join the $5 Meal Plan Family & sign up for weekly meals plans at 5DollarMealPlan.com! Fantastic! Shared with a friend. Erin, This is fabulous!!! Thanks!! But I want to reassure you that Modified Food Starch is gluten free in the U.S. unless it is made from wheat, in which case they would have to list Wheat as an allergen. After I read this post, I went back and re-researched it to make sure I wasn’t wrong. Please Google it and check it out for yourself. We have only maintained a GF household for about 15 months since my then 11 year old was diagnosed with Celiac. Every day is a new adventure in learning – but I wanted you to know this because it really isn’t one more limitation you need to worry about! Just to be safe…I switched out the brand names Linda! Erin–I will be linking to this post tomorrow, when I am also writing about gluten-free shopping at Costco! If you have questions or concerns about how I linked to your content, please contact me. FYI: Sweet Baby Ray’s is a DELICIOUS gluten-free barbecue sauce that is sold at Costco and most grocery stores. It is all my father-in-law uses, and he can eat whatever he wants! Unless it specifically says corn with modified food starch, you cannot trust it. I have had reactions when it says modified food starch, unless it says corn. You maybe having a reaction to something else then. We are highly sensitive and haven’t problem with any modified food starch from US made products. In the US, modified food starch is corn based, unless specifically stated otherwise. Great list though, will be put to use. Thanks Paul…we usually avoid it to be safe! This is a great start but now it needs to be GMO free and Paleo and I have never figured that one out at costco or SAMs. Do a search for Costco Paleo on Pinterest. I just saw a pin for Paleo products sold there. Please please please do a Paleo Plan! Hey Erin – great post! I did want to mention that sometimes modified food starch is from corn – so it depends. I am not a gluten free guru, but that I have checked on :). I loved the other 2 Costco plans (only had to make slight adjustments to be G-Free). Even my picky kids ate everything! I was so excited to see this newest one!!!! Thank you, Thank you, Thank you! Thank you so much for this! I can’t wait to try these recipes! Hi Lyndsay! We used to live over an hour away from Costco and would go once a month. It was well worth the trip! It required some detailed meal planning beforehand though. SAMs club is geared towards businesses while Costco is geared towards consumers in the home setting. This would be awesome except that my daughter who has Celiac is also a vegetarian! Can you come up with meatless meals??? Is the 6 pack of boneless skinless chicken breast, the organic 3 pack? I seem short on the chicken breasts. Or is it 6 lbs of chicken breasts? I am so excited about this! Maybe I can get that grocery budget under control! I am not the blog owner but I found the answer for you in the recipe section. If you click on the recipe, follow it down to the directions, you will see it says the ranchero chicken mixture and then the word “below”, keep scrolling a bit and just under those ingredients it says, “Ranchero Chicken (if making the slow cooker chicken tortilla soup, you will need to make as suggested above)”. Then it gives you ingredients for that portion of the meal. The first step in the directions then tells you how to make it. Hope that helped. Thanks for the info Kari!! I too was having the same problem as Krysty. When you purchase the printable package the recipe on there does not have any additional information or directions for “Ranchero Chicken”. This sounds great! I am going to try your slow cooker freezer meals first, but I was wondering: in this pack, how many of the meals can be frozen? It is just the two of us, so we will need to freeze some of the meals to space them out. I was wondering the same thing. Will $5 Dinners be making videos for this plan for preparation and freezing like the one that was made for the 20 Gluten Free Slow Cooker Meals? 🙂 Thanks! Quick question as I am new to your site, are these meals for a family of 4? Trying to figure out if I need to tweak for our family. Are these are freezer safe recipes? If you buy the plan does it give you more instructions? I bought the Udi’s GF bread today! Good to note that it is twice the size and even the slices are bigger than a regular Udi’s loaf found at a general store. Fantastic deal! Leftover rice is a breeze to freeze for future recipes. We’ll cook 4-5 cups in our rice steamer (resulting in 8-10 cooked) and freeze it in 2 cup packets. Perfect to add to a quick dinner or use plain as a side. Place a damp paper towel over a glass container and microwave it for 1-2 mins. Perfect! Looks great! If you haven’t already (I’m new here) consider a list that is mobile phone friendly in addition to printable. This looks great! I’m going to Costco tomorrow and can’t wait to try these recipes. I don’t see bacon on the list though, for the potato casserole? I found a great quality bacon at costco last time I went that I will be trying, thanks so much! So we can’t freeze these meals at all? We can just freeze the slow cooker meals? Am I reading these wrong? Casey – some are perfectly fine freezing. This was a different kind of plan than the specific freezer plan we just published for Costco. Just a quick tip I learned with my family making this- the Shepherd’s pie makes a TON, we ate it for 2 meals and still had 1/3 of a pan left, and my family was about to mutiny “not again!”, so I put it in a pot, added 2 cans chicken broth, a can of tomato sauce, and some Italian seasoning, called it Italian soup, and nobody was the wiser. 🙂 yummy! Still only 10 meals plus one! By my count that’s 11! Each recipe is made twice except for the Sloppy Joe Bowls. $162 for 21 meals seems expensive to me. I spend $100 at Aldi and feed 3 people for week. I will try Costco, it looks like a good gluten free product source. these meals can all be prepared and frozen ahead of time….correct? Is there a reason that you did not use the frozen chicken breasts and thighs? I know a big bag of them is only about $21 and there is a whole lot more than 6 in there. Not to sound dumb but where are the recipes? I can only find the grocery list. You have to purchase the meal plan for $2.49 by adding it to your shopping cart to receive the recipes and full shopping lists. Where do you find the actual recipes? I’d love to try this meal plan, but I can’t find the recipe print out for it. Do you have to pay for it? I want to be sure I’m not missing something :S Most of the warehouse ;lans have a “basic” and a “complete” option, but I do not see one for this plan 🙁 Does the basic option for this plan include the instructions or is it shopping list and recipes only? I really want to do my first “batch cooking” prep day, but we are GF and I need the game plan in addition to the recipes and lists 🙂 Please and Thank you!! Is this meal planning for one person or small family? All the recipes are written to feed 4 adults. This makes my homeschooling life much easier with celiacs in the house! I even saved more $ by making the chicken broth in my slow cooker from the Costco rotisserie chicken bones! Is it still possible to download this list of recipes and shopping lists?I don’t see any links for them..sound tasty. Thanks ! Did you freeze some of the meals? If so did you cook them before freezing?